When I returned to Mississippi to practice Civil Rights, the rage and anger that I experienced at Ole Miss was slowly re-ignited. I still retained dormant memories of the mistreatments that I had received in Mississippi, including being kicked out of Ole Miss. I was determined to use the Courts to challenge all of the Jim Crow laws and practices that were still alive and well in Mississippi in the 1970s. This was after the passage of the Civil Rights Act of 1964 barring employment discrimination, the Civil Voting Rights Act of 1965 which prohibited discrimination in voting and the Housing Acting of 1968 which prohibited discrimination in housing, yet Mississippi was still trying to hold onto its past Jim Crow practices. Immediately after I graduated from law school, I moved to Jackson, Mississippi to begin a one-year internship with Anderson, Banks, Nichols and Leventhal. My internship, which was funded by the NAACP Legal Defense Fund, was perfect for the training that I needed. There were five attorneys in the firm and each was uniquely qualified in different areas of practice. 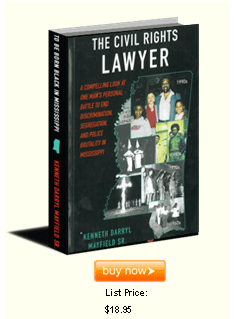 Mel Leventhal was the only white in the firm and was the primary litigator for civil rights cases. During my brief internship I was determined to learn all I would about civil rights and as well as other areas of law so I could begin my career as soon as I passed the bar. Less than two months after I was licensed to practice law, I moved my few belongings to Tupelo. I was prepared to sue anybody or any institution that discriminated against or mistreated blacks. 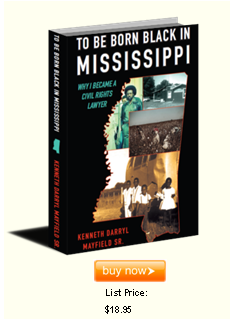 I filed Civil Rights lawsuits challenging discrimination in employment, denial of public accommodations and discrimination in housing, as well as police brutality and all other mistreatment of blacks in Mississippi. Fear was not a factor. I was like a patriotic soldier who is willing to put his life on the line for the greater good. Before I could begin to address discrimination against others, I had a few housekeeping chores of my own. To begin with, I filed a lawsuit in order to get space for my law office on Main St., in downtown Tupelo. Later, I filed a lawsuit against my former employer for firing me in 1970 when I was still in college. I even prepared a lawsuit against an apartment complex for refusing to rent to me. While I was waiting on my Tupelo office to be renovated, I operated out of a small satellite office in Okolona. It was in Okolona that I was retained by my first civil rights client. I filed a lawsuit against a reputed leader of the KKK in Winston County who had a segregated restaurant and did not allow blacks to eat in the front section. During the following year, I filed police brutality and racial discrimination lawsuits against the Mississippi Highway Patrol, City of Tupelo, City of Okolona, Sheriff of Lee County, Sheriff of Prentiss County, several Mississippi School Districts, City of Fulton, Counties of Lee and Union and many others. Before I realized it, I had filed over forty civil rights lawsuits, including several class actions, during my first two years of practice. When I began my civil rights practice, the federal courts in north Mississippi were fairly sympathetic to lawsuits involving racial discrimination. However, this compassion was rather short-lived and started vanishing quickly after the retirement of one of my favorite federal judges who was the Honorable Orma Smith. It didn’t take long for me to come to the realization that civil rights cases were going to be much more difficult to win without him. After the federal courts started turning a deaf ear on civil rights, I began to screen my cases very carefully and accepted only a limited number of cases. Moreover, I decided to join a movement at that time which involved boycotting for justice. When the occasions called for it, I took off my suit and tie, put on my army fatigue suit and combat boots and marched with many other black citizens in the streets of Tupelo, Okolona and Houston. In the midst of my marching and boycotting I met and married the love of my life. Marriage did not immediately change my focus on the struggle which I continued for another six years. My wife understood my commitment and supported me in every civil rights case that I accepted. However, after eleven years of engaging in the struggle, I decided that it was time to refocus my energies and seek financial security. One of the best decisions that I made was to ask Eloise to join me in my law firm. She was my greatest asset, and with his assistance, we were able to finally see a measure of prosperity. I invested all the extra funds that I earned in real estate and other business ventures. Eventually, I started a chain of rent-to-own stores that eventually became a multi-million dollar enterprise. After the birth of my children, I decided to take an early retirement from my law practice to spend more time with my family and develop my rent-to-own stores and other business ventures. I renewed my commitment to God and became involved in church. The joy and contentment that I have received as a result of being a born-again Christian and being able to rear my children in a Christian environment was priceless. In spite of my success as a businessman, I realized that my real passion was the practice of law and helping clients. After six years of my early retirement, I liquidated all of my business ventures and returned to the practice of law. Subsequently, I was appointed as school board attorney for the Noxubee County School District and later was appointed as Municipal Judge for the City of Okolona. In addition to serving as school board attorney and municipal judge, I developed a good reputation for handling cases involving auto accidents, bankruptcies and uncontested civil matters. During the period of time after I reopened my law office, I noticed that my client base was made up of a representative number of whites, as well as blacks. At first I thought they came to my firm unaware of my race, but later I realized that they were coming to me in spite of the fact that I was black. I later decided that I would integrate my staff and no longer discriminate against whites in my hiring practices. Although I don’t make the millions from my law practice as I did during the pinnacle of my career as a rent-to-own entrepreneur, I am able to make a very comfortable living. Practicing law for me is not a job; it is a passion. The joy that I receive from practicing law greatly exceeds the rewards of being an successful entrepreneur.